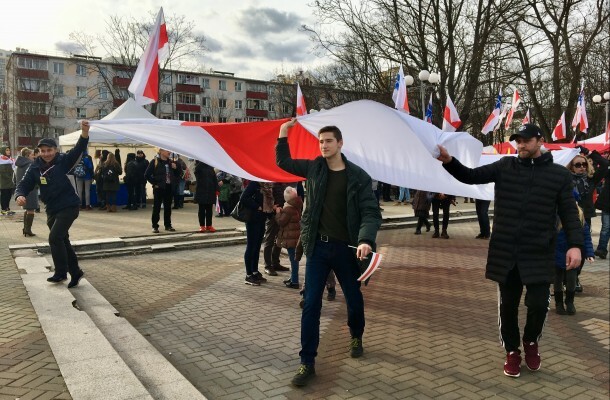 The March 24 celebration in the Kiyeuski Square lasted six hours and gathered, according to different estimates, up to 5,000 people. “Such levies are questionable from the point of view of the Constitution since we pay for the police work by our taxes, and we have a legitimate right for public events. Moreover, there are a number of issues in the case of execution of duties by the police in the Kiyeuski Square,” commented MFF Chairman Yuri Hubarevich on this decision. Firstly, he drew attention to the fact that during the event, unknown persons have abducted event participants — public activist Zmitser Dashkevich and BCD Co-Chairman Vital Rimasheuski — from the site, which was guarded by the police, and have taken them to an unknown location. “It was actually an abduction, not a detention, because the assailants had no insignia, did not introduce themselves, and did not name the reasons for the ‘detention’. Police officers in uniform present at the event refused to respond to the incident or even to tell us who coordinated their work in the Kiyeuski Square,” explained Hubarevich. Secondly, the police officers who were at the checkpoints acted illegally not allowing the participants of the mass event to leave the area with flying [real national] white-red-white flags. The police did not answer anything to the attempts to get an explanation of this behaviour and threatened people with detentions. The applicants filed a written complaint on termination of the contract to the City Administration Police Directorate, and don’t exclude a possibility of appealing to court.